The venerable Stephen Cohen lays into Hillary, Obama and the NATO military build-up against Russia with RT's Ed Schultz (formerly of MSNBC). The US and its NATO vassals continue to live in a fantasy land of Russian threats. But Barack Obama apparently can't decide if Russia is a threat or not. In March 2014 Obama declared Russia a "regional power" which was threatening neighboring countries "out of weakness." Yet now he says Russia has the "second most powerful military in the world." Wow, Vladimir Putin has engineered a remarkable climb in Russia's strength in only 2 years. On the eve of the Nevada primaries, a special presentation of the feature length documentary by Paul Jay reveals Las Vegas as a model of neoliberalism, a tale of the shape of things to come. It's all told through the eyes of a Canadian Blues Brothers act deciding whether they want to move their families to Vegas. It's two performers portraying two actors playing two fictitious characters in a town where everything is a replica of something else. The US will launch a Minuteman-III Intercontinental Ballistic Missile (ICBM) from California to the Marshall Islands some time over the coming weekend. An Air Force Global Strike Command unarmed Minuteman-III ICBM is scheduled for take-off between Saturday, Feb. 20 and Sunday, Feb. 21 from Vandenberg Air Force Base in California. 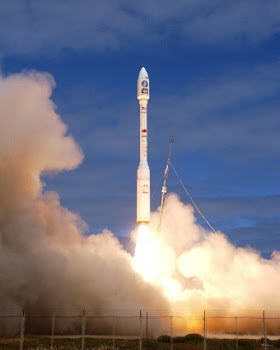 After all the recent feigned outrage about North Korea launching a satellite into space the US will press on by practicing the delivery of a nuclear warhead in the direction of China and North Korea. There are now 3,600 satellites in space of which about 1,100 of them are still operational and guess who launched most of them? Where is the global concern? 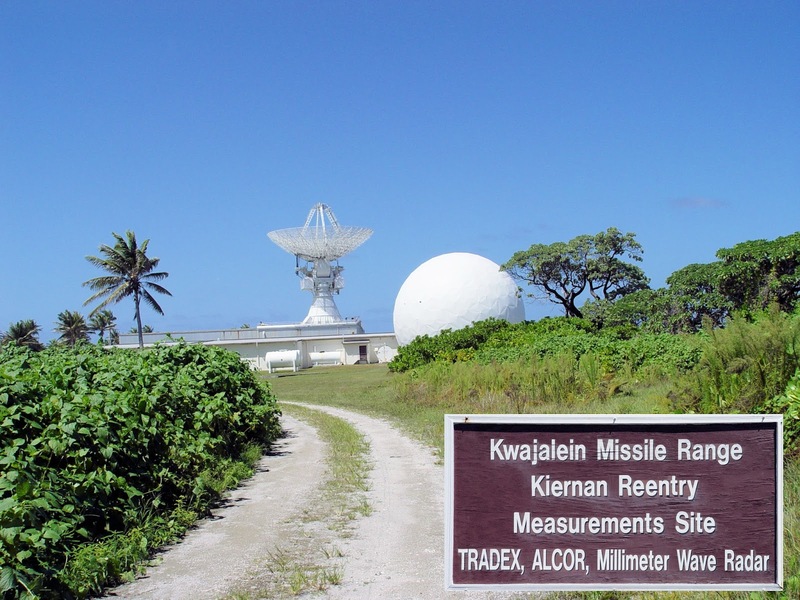 The Pentagon has been using Kwajalein Atoll in the Marshall Islands as ground-zero for nuclear bomb and missile tests since the nuclear age began. How about some international outrage about the environmental damage the US has done to this chain of islands? How about some screaming and hollering in the corporate media about the provocative nature of these US first-strike ICBM tests? The US reeks of hypocrisy. The US (and its chosen allies) can launch all the satellites they want and test all the ballistic missiles they want because - well of course - they are god's chosen people. If you've just seen Michael Moore's movie and are wondering how in the world the United States got diverted into the slow lane to hell, go watch Noam Chomsky's movie. If you've just seen Noam Chomsky's movie and are wondering whether the human species is really worth saving, go see Michael Moore's movie. If you haven't seen either of these movies, please tell me that you haven't been watching presidential debates. As either of these movies would be glad to point out to you, that's NOT HOW YOU CHANGE ANYTHING. "Filmed over four years, these are his last long-form documentary interviews," Chomsky's film, Requiem for the American Dream, says of him at the start, rather offensively. Why? He seems perfectly able to give interviews and apparently gave those in this film for four years. And of course he acquired the insights he conveys over many more years than that. They are not new insights to activists, but they would be like revelations from another world to a typical U.S. resident. Chomsky explains how concentrated wealth creates concentrated power, which legislates further concentration of wealth, which then concentrates more power in a vicious cycle. He lists and elaborates on ten principles of the concentration of wealth and power -- principles that the wealthy of the United States have acted intensely on for 40 years or more. Then the film shows us a clip of Chomsky saying the same thing decades earlier when he was still shown on U.S. television. He's been marginalized along with the rest of us. I imagine every friendly critic of this film has a #11 to add, and that they are all different. In fact, I can think of lots of things to add, but I insist on mentioning one of them. It's the same one missing from Bernie Sanders' home movie starring Iowa and New Hampshire. Its the thing missing from all U.S. discourse but showing up in Michael Moore's movie as a great difference between the United States and Europe. 11. 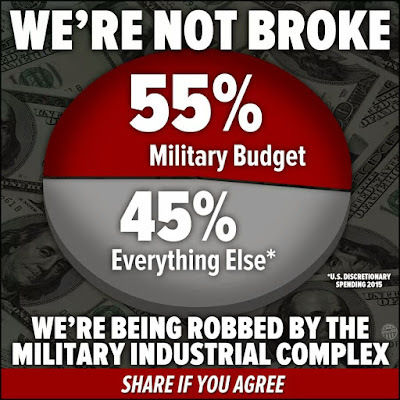 Dump Massive Funding into Militarism. Why should this be included? 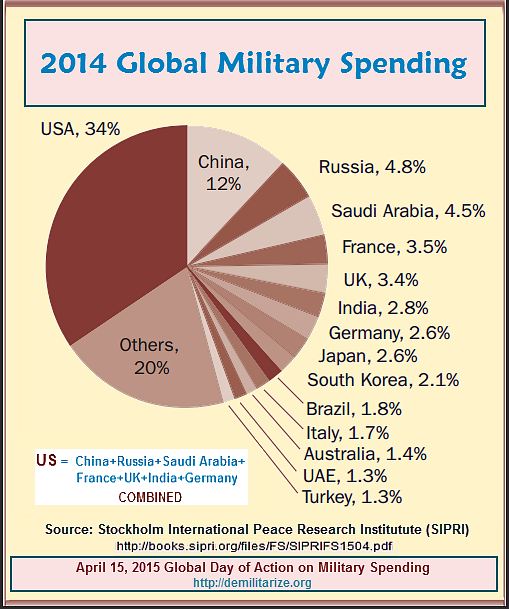 Well, militarism is the biggest public program in the United States. 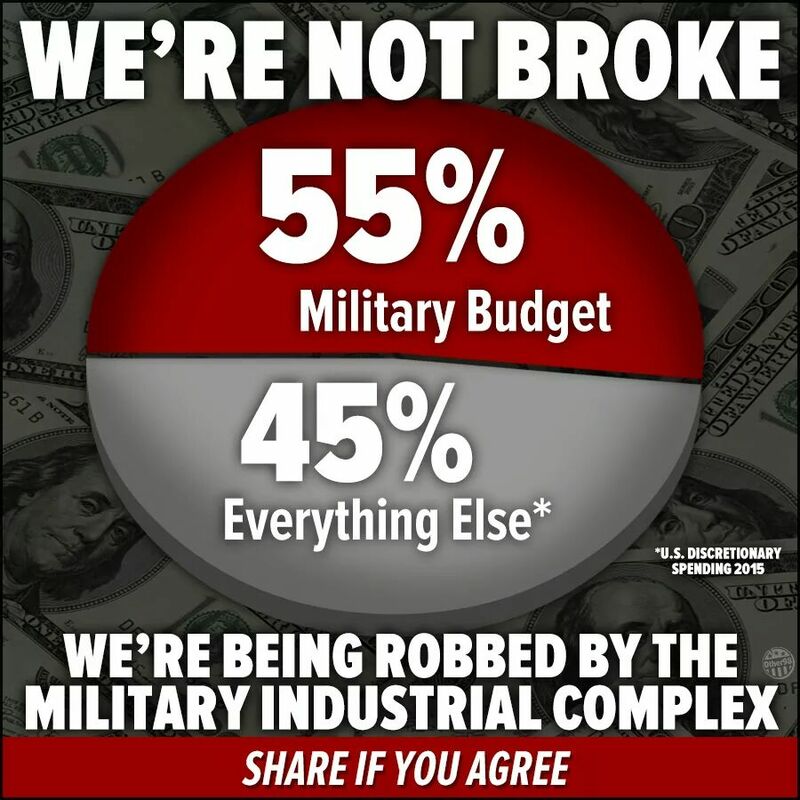 It's over half of federal discretionary spending. If you're going to claim that lobbyists are concentrating wealth through their influence on the government, why not notice the single budget item that eats up over half the budget? It does indeed concentrate wealth and also power. It's a vast pot of unaccountable funding for cronies. And it generates public interest in fighting foreign enemies rather than enemies hanging out on Wall Street. It does militarize the police for free, however, just in case Wall Street generates any disgruntled customers. Chomsky does, of course, oppose militarism. As far as I know he's consistently opposed it for many years. We see B-roll of him in the movie with anti-war books in his office. And discussion of point #1 above mentions the peace movement of the 1960s. How the single biggest thing that the wealthy and powerful do in their effort to expand their power over the whole globe didn't make the top-10 list I don't know. ~ David Swanson is an author, activist, journalist, and radio host. He is director of WorldBeyondWar.org and campaign coordinator for RootsAction.org. Swanson's books include War Is A Lie. He blogs at DavidSwanson.org and WarIsACrime.org. He hosts Talk Nation Radio. He is a 2015 Nobel Peace Prize Nominee. You will find our latest Global Network newsletter at this link just below. Please give us a hand by sharing the link widely so others can see the newsletter. You can also order print copies from us for local distribution in your community. All we ask is that you cover postage of the bundle to you. Let us know how many copies you want and we'll mail them and when the package arrives just send us back a check for the cost of postage. 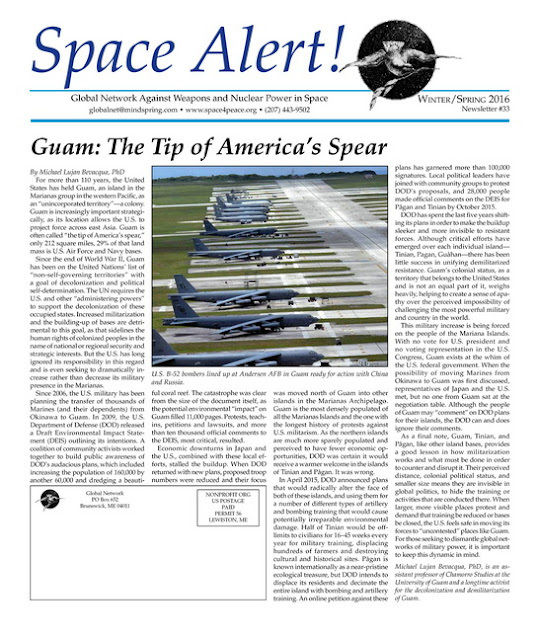 Many thanks for helping us spread the word about these important global space and peace issues. The American people don't understand what happens when you've been invaded by the biggest military on the planet and that you have to fight for every single square centimeter of your country in order to protect your land and your loved ones. 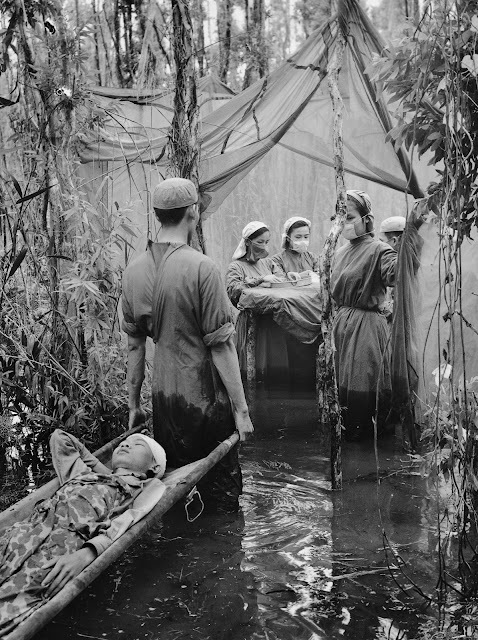 This picture was taken during the Vietnam war when the US ordered the bombing of neighboring Cambodia. In 1969, President Richard Nixon and his National Security Advisor, Henry Kissinger, unleashed B-52 carpet bombing for over fourteen months against a people who still tilled the soil with water buffalo. The 3,500 bombing sorties resulted in 600,000 deaths. The American bombing of Cambodia was a closely guarded secret primarily because the U.S. was not at war with Cambodia. On Sept. 15, 1970 a victim of American bombing, ethnic Cambodian guerrilla Danh Son Huol, was carried to an improvised operating room in a mangrove swamp on the Ca Mau Peninsula. This scene was an actual medical situation, not a publicity setup. The photographer, however, considered the image unexceptional and never printed it. Folks all over the world at this very moment are on the receiving end of US bombs - either dropped by Pentagon forces or their proxies. People are having to find ways to survive while back here in the good ole USA folks are distracted by sports, raucous presidential election debates, TV, and their daily struggles to keep food on the table. In this episode of teleSUR's Days of Revolt, Chris Hedges and Green Party presidential candidate Jill Stein diagnose the problems plaguing US politics, highlighting the dysfunction of a two-party system dominated by corporate interests. The UK's Labour party leader, Jeremy Corbyn, is causing quote, 'a great deal of nervousness' among NATO officials, that's according to a former head of the alliance. Lord Robertson says concerns have been raised by Britain's allies over Corbyn's vocal opposition to Britain renewing it's nuclear weapons program - which NATO relies on for defense. The Turkish army has shelled Kurdish targets near the city of Azaz in northwest Syria, including an air base recently retaken from Islamist rebels, with a massive attack. It also hit Syrian forces across the border, according to media reports. My reading of this is that the Turkey-Saudi-US supported ISIS forces are getting slammed largely due to Russian intervention in Syria. Turkey-Saudi Arabia are now reportedly preparing to do a land invasion of Syria to save the reeling ISIS forces. The US (as usual) is playing a confusing game of working both sides. The US supports ISIS because it wants Assad to fall in Syria and at the same time it sees Russia becoming successful and fears Washington will become irrelevant - so the US agrees to work with Russia on a ceasefire. Washington essentially is playing the role of a double agent.